At the outset of summer I found myself in the expert trap: I started talking and talking and talking, not leaving any room for anyone else. Deeply embedded in this shape is expertise and the assumption that she at the front of the room has it and we do not. It is an empty vessel approach, where we, as the audience, need to be filled with all the things we do not know. Moreover, even after we have listened for ages, we are given no opportunity to notice what we know and understand differently, to consolidate what we are learning. And we are not given this opportunity as an individual, or a small groups or large groups. We drink from the firehouse then leave with a few drops of nourishment. It’s not that this mode of information exchange is not needed–it is, under the right circumstances (see last two posts: shapes of conversation and direction or discernment). My point is this: Friend A was caught in a swirling environment of assumption that the best way to talk about connection was to disconnect ourselves from ourselves, and each other, and assume that the expert outsider has more information on the matter than we do. The ‘machinery’ of the city is caught in the assumption that we need to be told what to do, that we are not capable of figuring this thing out. Embedded in this is the further assumption that if we are simply told, we will go and do it and the problem will be fixed. Instead of leaving with a only a few drops from the firehouse (as is what happens with a lecture), people left having met and connected with people new to them. They met around topics of shared interest. They took some time to notice what the lecture meant to them in practical ways that will change their lives and the city around them; they began to integrate what they learned into their being as individuals and a loose collective. Friend A delivered on connection not just by inviting an expert in, but by creating the conditions for the audience–citizens–to truly hear the expert by connecting with themselves and each other. I almost wrecked everything for Friend A it because when Friends B, C and I met with her I fell into the expert trap. We sat at an outdoor cafe table on a sunny early summer day and missed that we were sitting in a circle. I didn’t let others speak. I said what I see, much like is written above, and then said it again and again. Passion, impatience and my own insecurity got the better of me. One of the reasons I most appreciate the circle as a shape for conversation is that it helps me find my place with others in a way that allows others to also have their place in the conversation. It does not diminish me: it focuses me. And most importantly, it allows us–me and the people I am with–to better see what we need to see. It does not diminish my passion, but allows it to show up more appropriately. And, of course, the irony is not lost on me. What I was most critical of out in the world was what I was doing myself. What I was most critical of out in the world was what I was doing myself. What opportunities do you see in your city to shift from the one-way “expert lecture” to create the conditions for collective discernment? What is your role in this? In my last post on the shapes of conversation, I made the distinction between forms of meeting that facilitate direction (the board table and the theatre) and those that facilitate listening and discernment of collective action. These two options–direction and discernment–are quite distinct from each other in terms of their usual shape, their purpose, and the assumptions made by all involved in where the expertise and leadership resides and how information flows. Further, the role of the “host” also differs, from chairing the meeting to creating the space, or a container, in which the discernment can take place. Both approaches are right–in the right circumstances. It is a matter of acknowledging the purpose of the gathering and designing for that purpose. 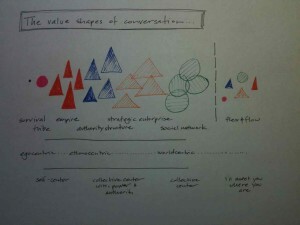 (For more on these purposes, see the shapes of conversations.) But these two choices are not mutually exclusive; the circle can be at the board table and direction can be set in a circle. These two choices are not mutually exclusive. The circle can be at the board table. Direction can be found in a circle. We don’t have two clear-cut choices. It’s not as though there will be no discernment for collective action at a board table, or that in working in circle there will be no direction established for the group or for individuals. What we do have to recognize is that regardless of the shape we feel the strong pull of expertise, and the assumption that expertise resides only in one or a few of us. We have a deep-rooted tendency to feel either that “I am the expert”, or to feel that “they are the experts.” There are times when this is true, like my doctor friend with expertise in infectious diseases that I described last week, who has a clear role to inform and direct other physicians about what to do when unfamiliar diseases present themselves. There are many times when we find ourselves with other people and the expertise is shared, but we operate as though expertise–mine or others’–is what rules the day. When we believe this, it dictates the shape the conversation takes, regardless of our physical form. When we find ourselves in the expert trap, looking for direction, or giving direction, we are not stepping into the shared leadership that we are called to offer. With the intention of collective discernment the circle shape can find its way around a table. It depends entirely on how we put ourselves in the conversation. Here are a three principles and three practices my The Circle Way Colleagues and I use, developed by Christina Baldwin and Ann Linnea. These principles and practices are a simple place to start, yet challenging to implement because they embody a significant cultural shift from our automatic expertise stance, to one that welcomes, invites and accommodates the diverse expertise within and around us. Openness to vulnerability is leadership–and this kind of leadership is shared and easier to carry if we are brave enough to notice when it is needed. There is a cultural shift required of us to embody discernment, whether at the board table, or in a circle. We are each required, as citizens, to be self-aware in ways we are not well-practiced, and this self-awareness is a necessary precondition to collective awareness and discernment. At most board tables self-awareness is a scary proposition because it comes with vulnerability, but in this cultural shift vulnerability is not a liability, but a strength. Openness to vulnerability is leadership–and this kind of leadership is shared and easier to carry if we are brave enough to notice when it is needed. Which principle or practice feels the most scary to you? The Circle Way Guidelines outline the components of circle, in addition to the principles and practices described above, that help create the conditions for collective discernment in a circle or even at a board table. **Caveat** This form of conversation is not easily accommodated in a theatre setting for this simple reason: people can’t see each other. Posted on August 18, 2016 Author Beth SandersCategories Art of Hosting, Be the Best Citizen You Can Be, Conversation, Nest City: The Human Drive to Thrive in Cities, Part 3 - Nestworks, The Circle WayTags Art of Hosting, Be the Best Citizen You Can Be, Circle Way, ConversationLeave a comment on Conversation: direction or discernment? This thought just struck me – what if the purpose of the cities/towns/villages is to bring people closer together? And the closer we get to each other, the more conflict there is. Is the purpose of the city then to generate conflict? What is the purpose of generating conflict? Conflict generates dissonance, a distinct or subtle sense that things are not right. A city, just like a person, can sit quite a while with the feeling that things are not quite right before we decide to take action. Smoking in restaurants, idle-free parking, deciding to support active transportation are all collective decisions that have come about as a result of conflict in a community. There is a pull in us to be closer together, but we also push each other away, to not live too close to each other. We resist being close, because we resist being in conflict. As a city planner and community volunteer I regularly hear people – on the public record and off – say they do not want people close to them, especially more people close to them. I wonder if we resist the pull to be closer to people because it brings conflict with it, and we tend to either avoid conflict wherever possible, or even stir it up, neither of which takes acknowledges of the wisdom within conflict. What are we missing as a result? What if I/we let conflict teach me/us? What would happen to cities if I/we welcomed and invited conflict for the purposes of generating new understanding? What if I/we viewed conflicts as opportunities? What if I/we found ways to work through and beyond conflicts? In the end, I notice that when I work through conflict, I arrive a new understanding. I change. Is that what I/we am/are afraid of when avoiding conflict? I have missed and overlooked a lesson that my kids are offering me every year: the gift of receiving. They are full of joy and trust and love. They are thrilled knowing this Christmas season they will receive gifts destined just for them. They are full of wonder and awe. I realize I have been making an assumption my whole life that giving is hard to do. It can be hard, particularly when I give something we are attached to. It was hard as a kid, but as I have grown older, it gets easier to see that what I have to give is more precious to others than it is to me. What has gotten harder is receiving gifts from others. Back to my kids – full of joy and trust and love when it comes to asking for receiving gifts. As an adult, I am noticing that it has become increasingly difficult to receive, let alone ask for, a gift. Receiving a gift – a compliment, a favour, a thank you, a gift – is fraught with emotion. A brush-off, suspicion, anxiety, fear, powerlessness, selfishness, vulnerability all take their turn. Within me, receiving a gift feels like I am broadcasting weakness. How dare I reveal that I don’t have everything I need, that I am all together. I must put on a brave face no matter what. If I am sick or hurt, it is easy to rationalize welcoming help. But if I am physically well, then I had better not ask for anything. But this does not serve me or others well, in the end. Even the gifts I did not ask for, the ones that make be feel bad but are really in service to my own personal learning and growing. Those gifts that I realize much later that really were gifts, not torture. At the bottom of all of this is my sense of self worth. The biggest gift I can give is to myself – the gift of receiving. I will be honest and reveal when my soul feels bad and ask for what I need. When I receive the gift of hard-to-hear feedback, I will receive it as a gift to be in better relationship with those around me. When the world says “no” I will take that as a sign that I am not needed there yet. When the world says “yes” I will take that as a sign to jump in the canoe and head down the stream. Receiving gifts is tough, perhaps because it is closer to my heart and my sense of well-being. Far more personal, even threatening. But also far more rewarding. And more giving. A parting note to self (via my friend Chris Corrigan) – it is hard to give if the gift is not received. “You look like you want to do something with the gloves. Follow your impulse.” These were our instructor’s words to one of my mates as we were going through our scenes one last time before we hit the stage. It can be a big leap to trust our instincts in this rational world, but it is our instincts that take us to a creative place where new possibilities arise. We have a choice to make about where and when we let our impulse out. If I truly notice that, what is my impulse about how to let it out? What keeps me back from what I truly offer our craft and the world? No matter how well you know your lines, you need to grasp the plot or you’re sunk.And your mate with you. There was a moment in my scene last night when I lost my line. Stuck. I drew a blank. It didn’t matter that my mate and I had nailed them many times before. Somehow I just lost track, and when I look back I can’t quite explain why. It just happened. We tossed a few lines in that “went with the plot” for a bit. It was shakey for a bit, for both of us sitting there in the bright lights, but my mate didn’t panic, neither did I, and we trusted we would find our way. We did. He threw me a word that got me back on track and all was good.Even when you know something well, you know it works, the recipe is never the same every time. Everytime the circumstances are different. In conversation or theatre, there is no silver bullet/cookie cutter. There are people rooting for you, even if you can’t see them.Often on the theatre stage, the lights are in your eyes and you can’t see the audience. You can’t tell if they are legion or few – except for the sounds they make. Even if you could see them, by and large to don’t know who they are.In the case of last night, it was a modest audience: our class mates, our instructor/director, the lighting guy, Citadel staff and a few people class mates brought to the event.Out front, I have a choice to make about how to proceed: trust that everyone is critically watching your every move, or trust that they want you to play a part in something wonderful happening. My choice about what I trust has an impact on what I will do and how I go about doing it. Do I believe in the worst or do I believe in the best? If I lose my lines, which plot do I want to draw on to carry me through? One of my son’s favourite television shows is Mayday, chronicling the events leading to and resulting in airplane disasters – or in the case of a recent episode, what should have been a disaster.We found big lessons for the pilots of our communities, cities and towns. In “Panic Over the Pacific” (Episode 6, Season 4), ChinaAirlines Flight 006 is bound for San Francisco.After an engine failure (one of four engines on a Boeing 747) that should cause no significant issues, the plane plunges 10 km in just 2 minutes.The undercarriage doors and horizontal stabilizers are ripped off the plane under the force of the plunge, yet the crew land the plane safely.By many accounts, they should not have been able to save the plane, then we find out that the plunge need not have happened in the first place. The conclusion: the pilot caused the plunge by focusing on the one instrument that was telling him the plunge was starting and choosing not to believe it.Due to massive fatigue and jet lag, he was spatially disoriented and unable to simply adjust as needed to the engine failure.The investigators confirmed all instruments were in working order.All the pilot needed to do was look at the other instruments to see that the plunge was indeed beginning, disengage autopilot, and put his foot on a pedal.The corroborating evidence was on hand – as well as a simple solution. 1.Focus on the “dashboard”, not one instrument. Attention to only one instrument – whether we believe it is right or wrong – provides us with only a sliver of information.A dashboard of instruments will send us more complete information and tell us if we are on the right track or not.Nothing is fully dependent on one instrument. 2.There is a reason why there is a human at the front of the plane. Autopilot is designed to solve the problems that we have come up with so far, but the creative human mind is needed when new problems arise that Autopilot can’t handle.In the case of our pilot over the Pacific Ocean, the pilot needed to intervene – just put a foot on a pedal.He didn’t, and they plunged to earth. 1.What brings us together?What is important to us? 2.Who are we? Who has the power to get us to our destination? 3.What is our destination?What will it look like when we get there? 4.What are the wise ways to get to our destination? 5.What are diversity of skills and gifts we bring to get us there? 6.How do we knit all of the above together through the messy process of community? In exploring the above, we find that there are many things that catch our attention; homelessness,residential densities, economic development opportunities, transportation and education systems, health care delivery, ecological impacts, parks and open spaces, opportunities for recreation, community development, energy generation, clean technologies, telecommunications, food security, urban design, emergency services, etc.There are many systems in place currently that monitor each of these.The question then is, are we watching all of them, or just one instrument like our pilot.Perhaps we do not all need to watch all of them, but we need to find ways and places to still do so.A collective sense of piloting is crucial to our survival. In the case of our pilot above, his misjudgment was attributed to fatigue.I am curious about the frantic nature of work that seems so predominant these days.What are we missing by moving so fast?Are we noticing our instruments?Are we misreading them?Are we afraid of them?Are we mistakenly on autopilot? Do we have the right instruments? How and when will we know if a Mayday call is legitimate or not?